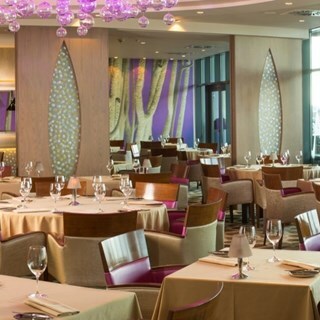 Chic and sophisticated Restaurant Sirocco in Jersey is an experience for all your senses. Classic Jersey dishes with a modern twist are served, with delicate flavours cooked to perfection. A contemporary approach to menu design is coupled with innovative presentation of dishes, to provide an experience for all the senses. 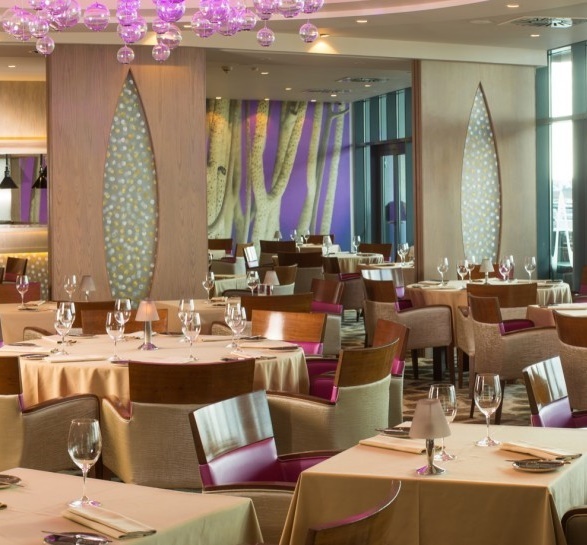 Dine amongst the stars and gaze out at the glittering waterfront. Appetite is our inspiration...enjoyment your reward. Excellent service and the waiter was so lovely with my daughter giving her a little easter egg and colouring. Wonderful family day and staff all very accommodating of small children. I can’t rate the service we received highly enough had the most amazing evening compliments to the chefs - outstanding. Sirocco is a beautiful restaurant, from walking through the the door till leaving we were treated to a fabulous time. The food was amazing, we had the taster menu with wine every course was beautiful... the desert platter to share was my favourite. If you want a meal to remember then this is the place to go. Good A La Carte Menu and good portion sizes but slightly expensive! First time in Scirocco food was amazing as was the service. Had service chard already added to the bill which we didn’t know about. Have enquired about this but not heard back. Everything was perfect, we couldn’t fault anything. Excellent Jersey Tasting Menu and accompanying Prestige Wines. Great service from all the staff, in particular Victor Nobrega. We wil be back to try the ordinary tasting menu in the late Spring/Summer. Staff and food are amazing. Will be back! Very good evening, lovely food & excellent service. Only downside is that waiter or chef should serve sauce/gravy separate in a gravy/sauce boat. Always lovely staff and fab food. Excellent service - food and presentation amazing! It was a quiet mid week january evening that we came but we could not fault anything! The food was delicious- would definitely recommend the steak Diane! All the waiters were lovely and very attentive, particularly head chef, Victor, there was nothing they couldn’t do for us! Thank you for a lovely evening! Sirocco was a lovely top of the range restaurant and we enjoyed celebrating my husband's 60th birthday with a lovely meal, The Rose wine was delicious and the breakfasts were out of this world. Very well organised at all mealtimes. I could see that the waiters were very experienced. Only snag is the food is very expensive so can only afford a special occasion treat. An excellent evening with great food and drinks. Staff were so helpful and accommodating. Really excellent breakfast which we had organised for our team, everyone thoroughly enjoyed it.